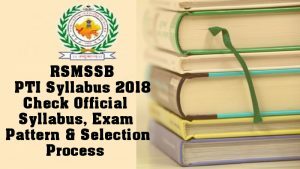 The RSMSSB PTI Syllabus 2018 updated in this page for the initializing purpose. The applicants of 4500 Physical Training Instructor (Grade III) Posts, catch the subject wise syllabus and download Raj Physical Training Instructor Exam pattern in the pdf format. The Rajasthan SMSSB PTI Syllabus Pdf downloading links are issued by the board on their official site @ www.sso.rajasthan.gov.in. RPSC Physical Training Instructor Syllabus: Aspirants, must need this syllabus to get the way of success in the selection process. Do you wanna appear in Rajasthan Subordinate and Ministerial Service Selection Board PTI vacancies, pick up the RSMSSB PTI Syllabus. The board also thinks about the candidate’s requirement of a syllabus, So syllabus topics have been attached with the detailed information. If you wish to gain the more information about this syllabus notice refer our page @ www.recruitmentindia.in regularly. This is the best opportunity for the unemployed candidates in the state of Rajasthan. Most of the aspirants won’t utilize this RSMSSB Physical Training Instructor Syllabus which was placed here in PDF format. So, Candidates, Firstly download the Recruitment Notification of RSMSSB PTI Posts and then apply to post after observing the eligible criteria, then hurry up! give away your application form in before the due date. This registration process will available up to 29th June 2018. So first apply it and then download RSMSSB PTI Syllabus. Also, Check out the various Latest Govt Jobs in Rajasthan at our site. Check Rajasthan PSC Physical Training Instructor (Grade III) Exam Pattern: The candidates feel tense about the syllabus and exam pattern. Totally the prelims exam contains 100 questions for 200 marks and the mains exam contains 130 Questions for 260 Marks. Once refer the Raj PSC PTI Exam Pattern, on before attending the written test for the reference purpose. Cover all topics to cross the cutoff marks and get qualified in the Test. Coming to the Rajasthan PSC 4500 PTI Posts Syllabus, the board officials cover multiple topics in the written test like Educational Psychology, Current Affairs, Geographical, Historical, Cultural and General Knowledge of Rajasthan etc. Applicants, first prefer the high weighted syllabus and then later concentrate time on remaining topics within limited space. Plan the preparation Properly, then you have the scope to revise the topic once again in mentioned in the RPSC PTI Syllabus. Postulants, also refer to the Previous Papers in this page. Geography, History, Culture of Rajasthan. Role of women during a Medieval and Modern period. Nehru’s contribution in its making. scope and implications for a teacher in classroom situations. Self-concept, attitudes, interest, habits, aptitude and social skills. Latest general rules of above Games / Sports. Proper sports gear of above Games / Sports. History of above Games / Sports. Physical education in ancient India: Vedic period, Epic period and Medieval period. Definitions and principles of Physical Education. Physical education in the city/states of Greece and other countries. Psychology: Meaning, Definitions, Nature, Branches, and Scope. Sports Psychology: Meaning, Definitions, and Nature. Food, nutrition, balanced diet and diet according to sports activities. Anatomy: Meaning, concept, need, and importance in physical education & sports. Health education: concept, objectives, importance, and principles. Catch RSMSSB PTI Syllabus @ www.sso.rajasthan.gov.in: After enrolling starts the groundwork of the preparation in the exam point of sense. Contenders, save the time in the preparation process because you will have a chance to touch the additional topics. Also, practice the most tests and previous papers along with the RSMSSB PTI Syllabus. By practicing well with Syllabus & Previous Papers, then you might have a chance to achieve higher marks. Find the RSMSSB PTI Syllabus link on the homepage. Open on the link and then find the subject wise syllabus are present or not in the link. After checking download the RSMSSB PTI Syllabus in a prescribed format. Download Rajasthan Subordinate and Ministerial Service Selection Board Syllabus and exam pattern for the Future preparation purpose.